Charge your phone using the Biotech Wood Burning Campstove. It’s available on Amazon for $129. If you’re out camping in the middle of nowhere, and you just need to charge your phone, you can try the Biotech Wood Burning Campstove. 20 minutes of charging will give you 60 minutes of talk time. You can even boil a cup of water for less than 5 minutes. You can even roast a marshmallow while you wait. Remember several years ago when Twitter crashed quite often. They have not had that issue in a while, at least to my knowledge. Now, for YouTube to crash a few minutes ago, that’s something else. I’ve never seen it, ever. The problem was short lived. YouTube recovered less than a minute, but it was very interesting. 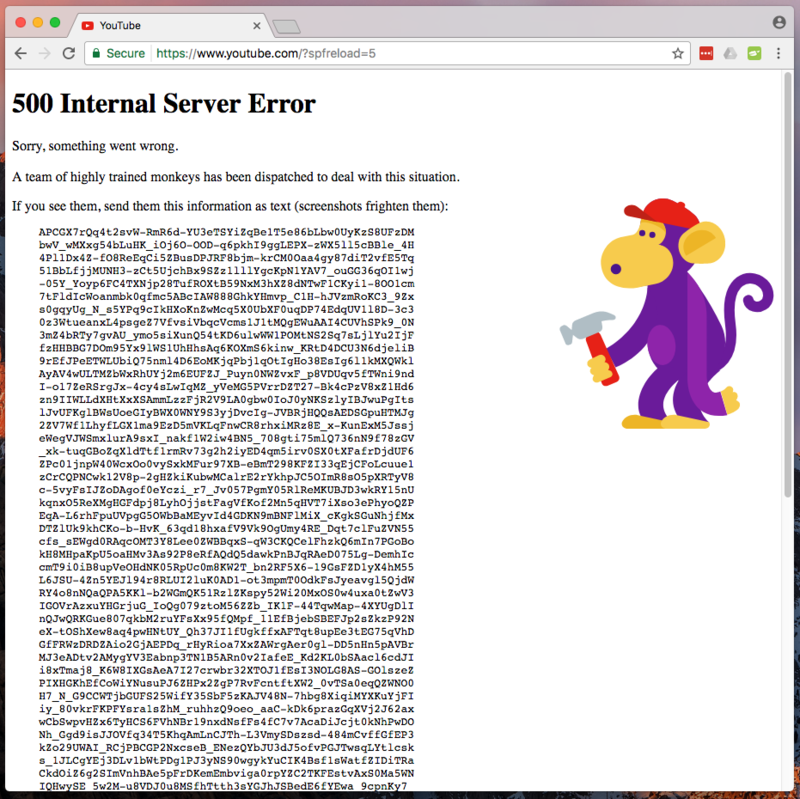 The 500 server error and the monkey graphic was pretty cool. Here’s a snapshot of the crash. HowtoForge offers excellent instructions on how to install applications, servers and tools on multiple Linux distributions. Instead of recreating what’s already done at HowtoForge, here’s the installation instructions to install Samba fileserver on Debian 9. It walks you through the installation, adding Samba shares, managing users, and accessing Samba from a Windows machine. Here’s the link.